Pumpkin is everywhere right now. In coffee, on bagels, baked in cookies, whipped into mousse, roasted, stewed and frozen. Try to avoid it. I dare you. Rather than run away from the squash invasion, I’ve embraced pumpkin and its similar fall vegetables butternut squash and acorn squash. This pasta is coated with a thick, savory sauce that has the texture of a creamy pasta sauce without all the fat. Perfect for a chilly, fall night when you crave something as rich as mac and cheese, but still need to lace up your running shoes and move forward. 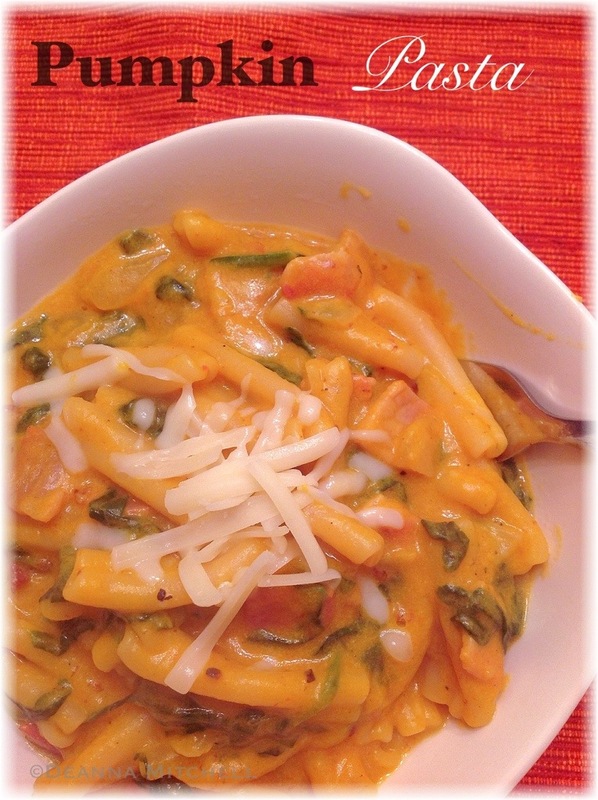 This recipe is based on one for Creamy Pumpkin Pasta by A Bird and a Bean, but it reduces the fat content, ups the pumpkin and reduces the amount of meat without sacrificing flavor. Think of this as a foodie version of a cozy fleece jacket–warm, comforting and satisfying. We used a wonderful, smoked, lean Canadian bacon from Mae Farm, and this added a tremendous amount of flavor with very little meat (saving fat and $$$). If you don’t have Swiss chard, you can easily replace it with chopped, fresh spinach or another mild green. Embrace pumpkins and fall greens this fall! Heat water for pasta in a large stock pot. While water is heating, warm the olive oil in a large skillet over medium-low heat. Add the onion and cook 2 minutes or until onion softens. Add the garlic and cook 1 minute. Add the chopped Canadian bacon and cook until warmed through–about 2 minutes. Remove vegetables and meat from the pan. Add the stock and whisk to deglaze the pan, bringing up all the brown bits (they have lots of flavor). Whisk in the almond milk, pumpkin, sour cream, nutmeg, pepper and sage, and whisk well. Add the onion mixture back to the sauce and the chard, and keep warm over low heat. Cook the pasta according to directions and drain, reserving 1 cup of the pasta water. Add the cooked pasta and cheese to the sauce, tossing to coat the pasta well with sauce. If the sauce is too thick, add a bit of the pasta water to thin. Pasta sauce should coat and stick to the pasta.